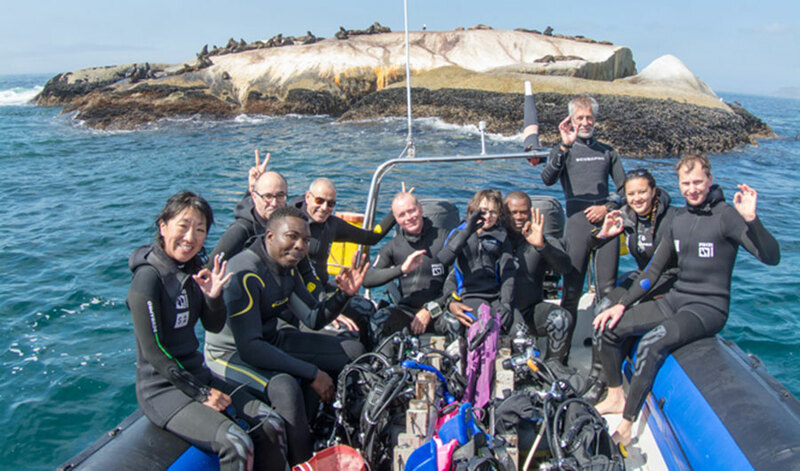 The Cape Fur Seal dive is a super fun and interactive dive and one of the signature dives that Cape Town has offered for more than two decades. The seals are very playful and love to show their acrobatic skills to divers. These seals are used to divers and are not shy at all, they will often jump in the water in large numbers to come and investigate and play with divers. We dive at Partridge Point, an exposed haul-out spot for seals. There are times when the water can be rough at the site due to waves or currents. We will make a careful assessment before entering the water and reserve the right to divert the divers to a more protected site if conditions warrant it. A shallow section of the reef, known as the amphitheatre, is the best spot to interact with the Seals. The deeper sections of the reef offer beautiful marine life, swim-throughs and large sea fans. Seal snorkelling is a fabulous way to get up close with the Cape Fur Seals. Join us for a fun experience! Hotel transfers can be arranged. Dress warmly for after the dive. 7mm wetsuit and dive gear provided. Hotel transfers can be arranged to the dive school. Diving at Partridge Point Simons Town. Meeting time at dive Shop 9.00 but exact time to be confirmed the day before the trip and is based on weather conditions. Briefing and departure time 10.00. The snorkel site is about 15 minutes away from the launch point. Children under 10 are not advisable unless skilled swimmers with parents to dive as well. Duration 2 – 3 hours. Swimming Costume, towel, cap, sunglasses and sun screen. Book now for the best snorkelling experience EVER! Come Snorkelling with Cape Fur Seals in Simonstown! Enquire now for the experience of a lifetime!